I attended a hair event last night and needed to transform my daytime look to evening one as the dress code was Evening Wear I needed polished nails to go with my cocktail dress. I didn’t have time to paint my bare nails so decided to pop into Boots to see what stick on nails they had…I don’t really do fake nails. 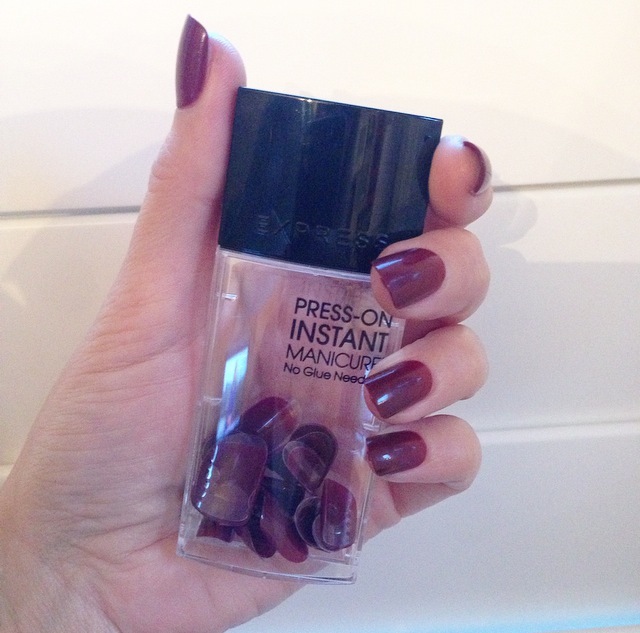 I came across these press on nails in my favourite colour which is timeless and compliments my skin tone. 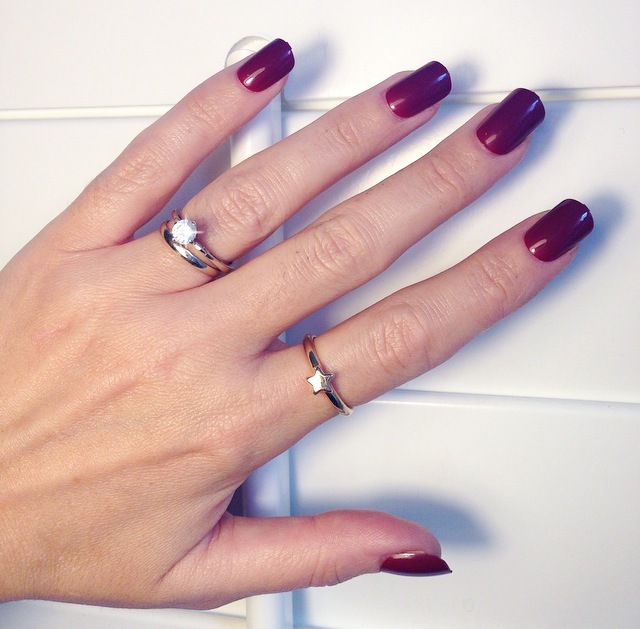 This hue is called “Polished Garnet” I thought they would look nice when sipping my champagne on arrival whilst doing small talk with fellow hairdressy people. The packaging is cute, a container shaped like a nail polish bottle. What I really liked is that they are pre-glued as I didn’t have too much time to apply them also I wasn’t at home. I applied them in about 5 mins (while drinking a glass a of wine in a bar) waiting for my friend Paul to arrive before going on to the event together. These press-on nails were very easy to apply, first you select each size then peel off the protective layer revealing a gel like glue, press each one on your nail from the cuticle. It also contains a wipe to clean your natural nails to prepare them for the adhesive to fully stick. The sizing wasn’t perfect for me but fine for “one night” and quite comfortable. They can be worn for up to 7 days with tips in the instruction booklet to prolong the wear. They are still firmly in place now as I type this following a day of household chores and doing up buttons etc. Personally I find them a bit too long for daily wear but I have to say I’m starting to grow attached to them. All in all I think these are a great option for one day or night wear if you find yourself in hurry with no time to pain your nails. They certainly did the job complimenting my outfit and looked great all night but most importantly didn’t ping off!!! You can purchase these elegent touch press-on nails at boots £7.99 or 799 points, I used my points and got them for free! Have you tried any DIY false nails? I would love to hear your experiences. I have tried false nails before , the ones with a glue but they did not last very long , and its kid of messy job to put them on , so I kind of give up on those , but after reading your review I think that I would love to try press on manicure it looks interesting . Yes I completely agree, that’s why I don’t normally use them. These were so easy and quick with no mess.